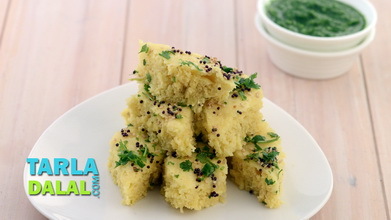 Green peas dhokla, easy and delicious dhoklas that are made nutritious by the addition of green peas, which are full of fibre and also impart a nice green colour. 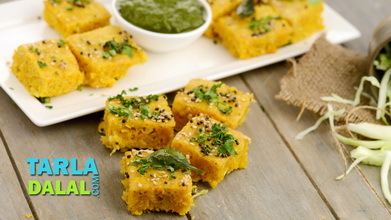 Besan is a versatile ingredient that is used to make most farsaans. 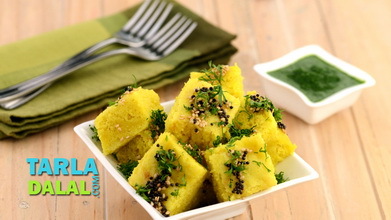 Citric acid crystals are added to impart the required tanginess to this dhokla; you can also use lemon juice. 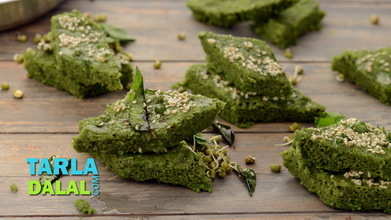 Combine the besan, green peas purée, salt, powdered sugar, ginger- green chilli paste, citric acid-water mixture and ½ cup of water and mix well with your hand to get a smooth mixture. Keep aside. Grease a 175 mm. (7") diameter thali with little oil. Keep aside. Just before steaming, add the fruit salt and add 2 tbsp of water over it. 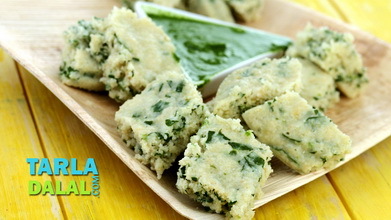 Pour the batter immediately into a greased thali and shake the thali clockwise to spread it to make an even layer. Steam in steamer for 12 minutes or till the dhoklas are cooked. Keep aside. Heat the oil in small pan and add the mustard seeds. 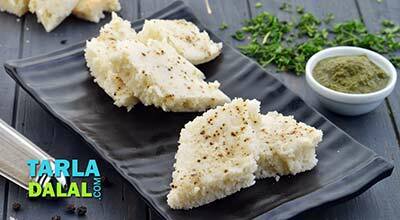 When the seeds crackle, switch off the flame, add the asafoetida and green chillies and mix well. 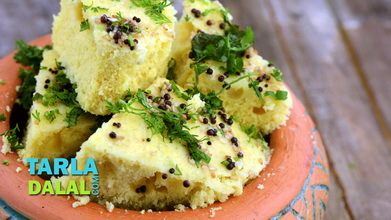 Add 1 tbsp of water and pour the tempering over the dhoklas. Cool slightly and cut into square pieces. 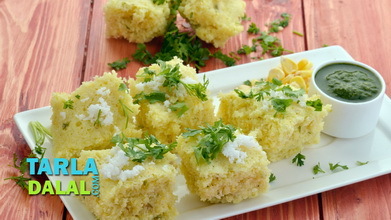 Garnish with coriander and coconut and serve immediately with green chutney. Always use your hands while mixing the batter to break the lumps. 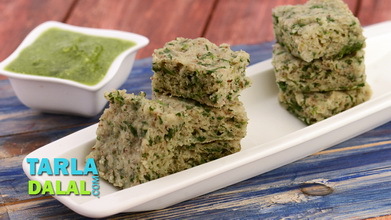 To make 1 cup green peas purée, blend 1½ cups fresh green peas in a mixer till smooth. Keep refrigerated till use.